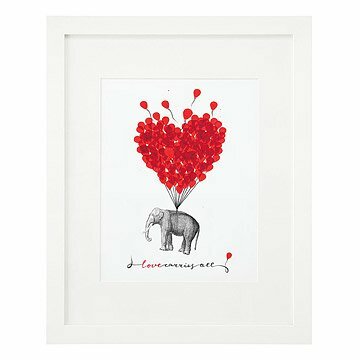 Show the one you adore that the strength of your love could lift an elephant with this work of art. Show the one you adore that the strength of your love could lift an elephant. This print, "Love Carries All," by Zlatka Paneva brightens any room with a carnival-like joy and a calming sense of optimism. Perfect for the pachyderm-loving partner. Zlatka Paneva's art work is a combination of reality, sources and imagination. Her prints demonstrate surrealist and pop art influences that play with mother nature and the animal kingdom. Her designs in numerous media are made in Los Angeles. Comes ready to hang in white BonanzaWood® - Eco Friendly Frame, white FSC certified matboard (Artique), plexi, or unframed. Excellent experience. The customer service gals go above and beyond. The poster far exceeded my expectations. I will certainly recommend this site to all of my friends and I will definitely return when I have a need. Great additio for elephant lovers. Nice quality. This is such a visually appealing piece. But, as nice as the content is, you would think the frame would be nicer. Other than that, it is very appealing. My wife loved it. It's a really nice piece. Best Mothers Day present Ever! My mother appreciated this gift - better than the most expensive jewelry! This is so unique! I love how it express the power of love. Purchased for baby's room - so cute and arrived in perfect condition. Love it!!! This piece of art is so unique and attractive! I wanted something special and not just an average, been done before anniversary gift for my sister and her husband. They are a very special and loving couple and this gift helped me express that to them. They put it up on the wall right away and are so happy with what it brings to their home. My husband loves elephants. So between the lovely sentiment, the vibrant red colors, and the elephant it was a perfect gift for his 70th birthday.